Last week I was in Amsterdam for work, so I took the opportunity to get some accessories for my bakfiets. 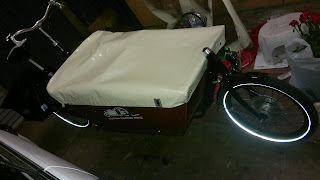 In fact, if I am honest, I chose my accommodation partly on the basis of proximity to a workcycles.com store. The main thing I wanted to get was a 2nd bench so that we could fit three in at once, since we have already had occasions when one of the cousins wanted a ride, and Caleb was rather unimpressed about being removed to make room. Here is Caleb and Isabel ready to set out for the first time on separate benches. You can also see the panniers I bought in a Dutch super-market for the equivalent of AUD$44! 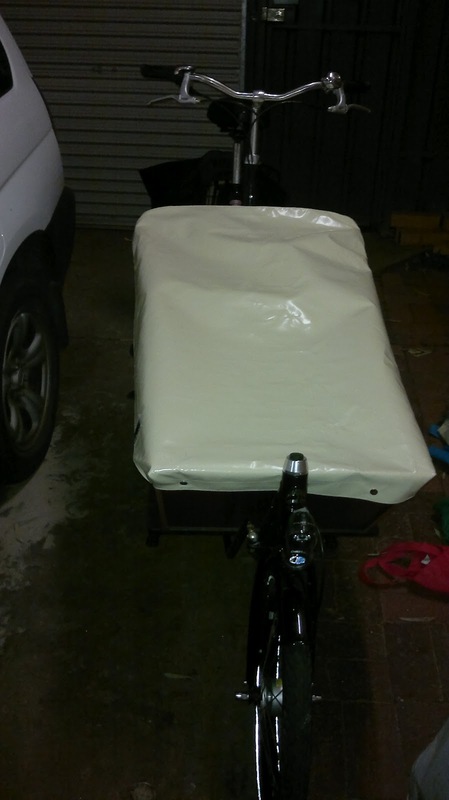 The panniers were an absolute bargain at AUD$44 compared to local prices. In fact, I could have got them for about AUD$23 if I didn't mind pink. 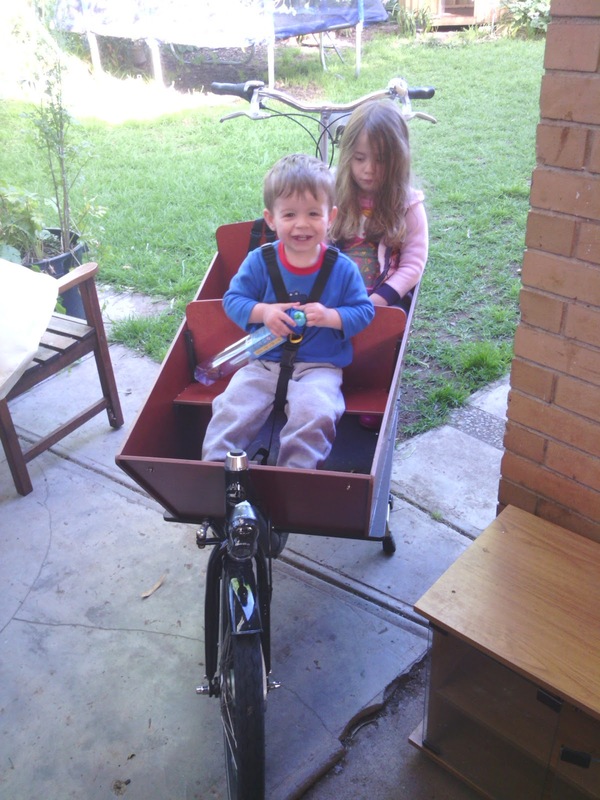 They fit fairly well, and have slots in the top for the built-in bungy cords that the bakfiets rack (and that of most European city bikes) feature. The guys in the shop were really helpful, and in addition to fixing up the rental bike I was riding, showed me a safer way to install the extra bench with a retaining strap so that the extra bench can't fly out in an accident. I took a couple of pictures while I was in the shop to see how it all fits together, including adding the retention strap. 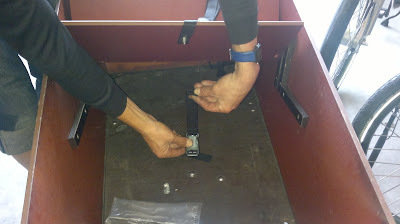 You can also see the wedges that screw into the box to support the extra bench. The bench itself slides down between the two almost-upright parts, and the seat rests on the near-horizontal part. Here Caleb and Isabel try it out before setting out. If you are planning on installing one of these yourself, there is a great series of images that I found really helpful. The kids are quite happy riding on the back bench, or at least were until there were separate benches. Now if there are just the two of them, they will sit on their separate benches. This has the advantage that they can't really bother each other too much. Isabel loves sitting up front, where she is prone to leaning forward into the wind Titanic-style. I also took the opportunity to get some miscellaneous spare parts and a flat cover for the bike which can be tricky or expensive to source locally. I was going to say that this is more aerodynamic than the full wet-weather cover, but honestly "aerodynamic" is not an adjective that really belongs with an eight-foot long cross between a wheel-barrow and a statfiets with a riding posture that puts your head above most most of the cars around you. But it is certainly better to be able to cover your luggage in rainy weather without having to ride a bike with what amounts to a medium sized sail. With the flat cover on. And from the side. You can also see how visible the reflective strip on the Marathon tyres are here with the flash. 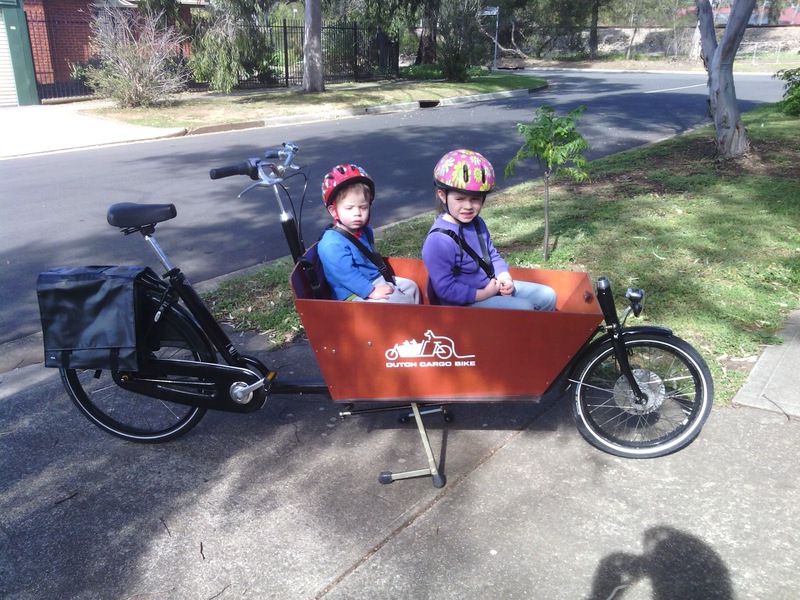 I've recently purchased a Bakfiets and stumbled across your blog whilst trying to figure out which panniers to get. What sort did you get and would you recommend them to others? Also, I'm wondering about the flat cover. I already have the rain cover (sail! )and am wondering how much use I'd get out of the flat cover. How often do you use yours? I got my panniers from the bike parts shelf in a supermarket in Amsterdam for EUR35 I think. Search for "fietstas" on hema.nl and you will find variations between EUR 10 and EUR 55 (with photo printing it seems). So have a look there, and bribe a Dutch friend to post them for you. If you don't have any handy Dutch friends, let me know, and I might be able to wrangle something for you. 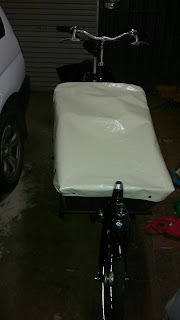 As for the flat cover, it is invaluable during winter, and also when parking the bike so that you can leave some incidental stuff in there without worrying about it going missing immediately, e.g., when parking at a shop for a few minutes. Of course, I don't leave any valuables in there. for our bakfiets. they have been great, waterPROOF and cheap. i put reflective stickers all over the rear for super visibility. if you want to build them i can let you know the changes i made to this original plans. I am sure that the information would be of interest to readers, so yes, please. If you like, I can post the information (and any images) to the blog so that all information is in one place.